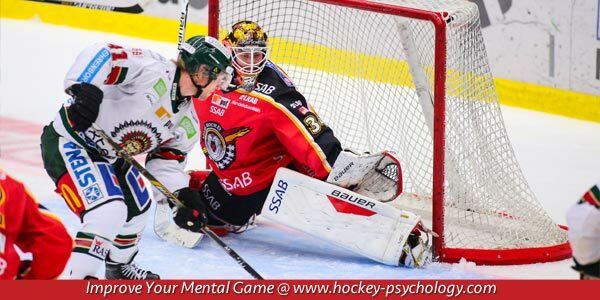 You are here: Home / Hockey Psychology Articles / Do You Over-Think Your Hockey Game? Have you ever failed to execute your skills in competition that you have repeated over and over successfully in practice? What makes an athlete unable to perform simple tasks in competition that they have repeatedly performed for years in practice? Over-thinking is one culprit that interferes with an athlete’s ability to perform in games as well as in practice. As an athlete begins to think about how to perform certain skills while competing, he disrupts the fluidity of movement, making basic habits difficult to perform. Troy Brouwer, 28 year-old right winger for the Washington Capitals, has experienced a difficult 2013 season. Brouwer signed a three-year contract extension in 2012 with an annual salary of 2.35 million per year but has not performed up to expectations. Through the first 28 games of this season, Brouwer recorded only five goals and 4 assists. At one point, Brouwer scored only one goal over a 15 game span. It is important for a player to quickly get into the flow of the game. Changes to routines and personnel can take a player out of his comfort zone and cause him to over-think and try to make things happen. Brouwer has struggled to find his rhythm this season. Brouwer has played with rotating linemates throughout the year which changes his role from one game to the next. There are many reasons an athlete may over-think in competition, such as trying to do much, being nervous, attempting new skills, correcting previous mistakes, focusing on personal statistics and feeling uncomfortable in his role on the team. To overcome the problem of over-thinking in competitions, you must uncover the reason for over-thinking. You should recognize your strengths/ role on the team and play accordingly. You need to over-learn new skills through repetition in practice. Games are for playing or reacting, not thinking. You must let go of previous plays or mistakes and focus on the present play. You should learn how to let go of the practice mindset and instead perform to play great today. Remember, your level of play is your responsibility. The choices you make will reveal themselves in your performance.